1. For healthcare providers and those trained: conventional CPR using chest compressions and mouth-to-mouth breathing at a ratio of 30:2 compressions-to-breaths. In adult victims of cardiac arrest, it is reasonable for rescuers to perform chest compressions at a rate of 100 to 120/min and to a depth of at least 2 inches (5 cm) for an average adult, while avoiding excessive chest compression depths (greater than 2.4 inches [6 cm]). 2. For the general public or bystanders who witness an adult suddenly collapse: compression-only CPR, or Hands-Only CPR. Hands-Only CPR is CPR without mouth-to-mouth breaths. It is recommended for use by people who see a teen or adult suddenly collapse in an out-of-hospital setting (such as at home, at work, or in a park). 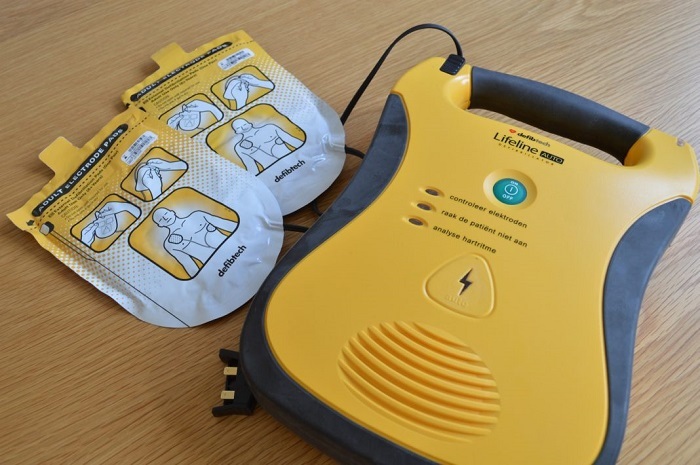 A few key things to know about using AED’s: They will only deliver a shock if it’s needed. The machine analyzes the hearts rhythm between the pads (pictures on the pads depict exactly where to place), so you cannot accidentally get shocked as some believe. If the pads do not stick because of hair, you may need to shave the area first before applying. Your first aid kit should have a razor if the AED doesn’t have one. Lastly, if you see bulge under the skin where you are to place the pads, it could be an implant. Do not put the patch over this, place the pads beside it. Medication patches should also be removed.